I actually posted this on my website a month ago, but I just added the ability to save games and updated the compiled downloads, so I figure it’s time to officially announce it here. 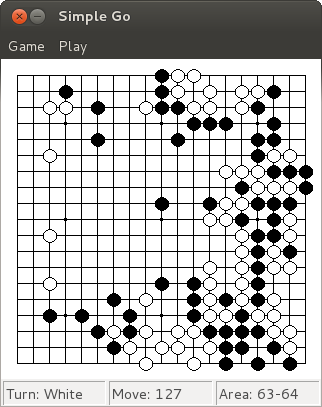 As far as Go implementations go, it is rather basic; one unique feature that it has is the ability to play random games, i.e., when both players place their stones on the board randomly. I was curious the kinds of patterns that would arise in such games, and how such games would end, assuming that players don’t pass unless absolutely necessary and that no board position can ever repeat (superko). This was another impetus for writing Simple Go, since I couldn’t find any other program which allowed me to try this. Simple Go was written in C++ using the cross-platform library wxWidgets. The source code is available on GitHub, but pre-compiled binaries are also available on its webpage. Enjoy – I quite enjoyed writing it.